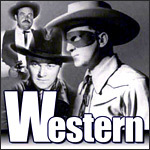 Listeners were given one last great western as the Golden Age of Radio was coming to an end. "Specially transcribed tales of the dark and tragic ground of the wild frontier" told the "dramatic story of Lee Quince, Captain of Cavalry!" Raymond Burr starred as Quince, the strong and sympathetic leader of Fort Laramie. The setting for this series was based on a real fort located in Laramie, Wyoming, and the program placed an emphasis on realism and historical accuracy. According to the show’s producer and director, Norman Macdonnell, the show was to be, "a monument to ordinary men who lived in extraordinary times."